Save money and buy direct from the tops hangers manufacturer. We deliver the best value because we manufacture clothes hangers in our modern factory in Ireland. Cut out the wholesaler and get the best deals only at hangers.ie! 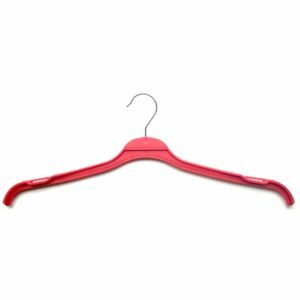 Choose from our wide range of plastic tops hangers. Order handy packs sizes starting at just 10. Plus order larger amounts including packs of 50, 100 or box quantities. Use our 41cm wide D41 to hang blouses and ladies t-shirts. Perfect for preventing blouses from creasing and also with a space saving flat finish and strong metal hook. Hang the latest fashions on our stylish T44 hangers. Their beautiful, slim design is also ideal for displaying ladies tops and dresses. Simply slip top and dress loops over the upper slits. Plus, order the T44 in black, red or silver. Order our 40cm wide LU3 dress hanger to hang both dresses and tops. Use the upper notches and lower hooks to hang dress straps. Also, available in black or natural colours. Buy our best selling BB45 shirt hangers to keep your shirts in perfect shape. Prevent collars from creasing because of the special design of the BB45 neckline. Also, use the BB45 to hang t-shirts. Plus, order our BB45 in black, green, red, silver and white colours. Made with a strong, durable swivel chrome hook and with a flat, space saving design. Use the BB45 to hang shirts neatly in your wardrobe. Use our 46cm wide K46 knitwear hangers to keep your jumpers and sweaters in the correct shape. Hang knitwear in the perfect shape because of the extra wide 46cm size. In addition, the non-slip shoulder grips prevents knitwear from slipping off. Order our K46 in either black or bronze. Looking for a low cost but very effective way of promoting your brand? Printed tops hangers are a perfect solution. 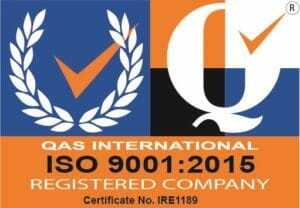 We print logos on the oval shaped label area. Read more about how we can help you promote your brand. Use wire tops hangers as a low cost way of hanging lighter tops. Choose between bronze, silver and white wire hangers. Also, order small packs starting at just 10. Choose either cream or red satin tops hangers, 43cm wide, to hang your fine dresses and tops. Also, perfect for retail display and showing off the latest dress and tops. Order top clothes hangers direct from the manufacturer in only a few clicks at hangers.ie. Also, free delivery to Ireland and UK on all orders over €75 + VAT or Sterling equivalent. Pay using our super fast and secure PayPal Express Checkout.